Adobe Lightroom's labyrinth of controls is widely known, and widely accepted as just part of the price you pay for such powerful software. No more. 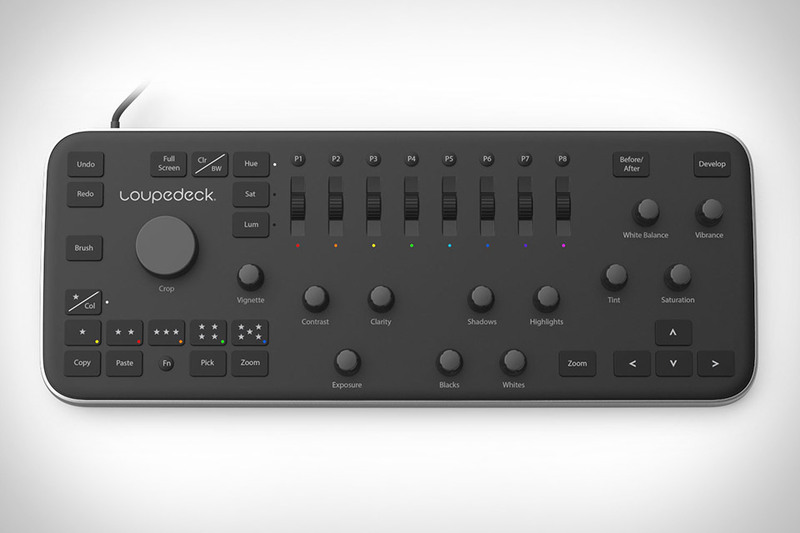 The Loupedeck Lightroom Editing Console gives you physical, real-world controls for your most common adjustments. Rotary knobs for things like exposure, white balance, and saturation are present, as are a number of dedicated buttons for tasks like undo, redo, flag, quick zoom, and navigation. The keyboard-sized device is finished off with an oversized dial for rotating and cropping, scrolling surfaces for controlling individual color channels or presets, and a matte black and silver design that will look great on your desk. Like it or not, charging up our myriad devices is a daily ritual now. Make it a little less messy with the Eclipse Universal Charger. This sleek accessory takes advantage of its circular shape to wind up to 24 feet of cables inside, with a pop-up lid that hides them completely when not in use. The burly braided cable that runs from the charger to the wall gives you an extra 4 feet of slack, and the 7.8 Amp charger ensures that even when all three charging ports are occupied, your devices get the power they need as quickly as possible. There are tons of ways to access and share your memories in your home, like smartphones, tablets, and TVs. None are quite as simple as the Loop Connected Photo Display. Vaguely resembling an old tube set, it has 10-inch high-resolution screen and a simple interface with two knobs: one for skipping through individual photos and videos, and one for skipping through "channels" of photos from sources like Facebook, Instragram, and Dropbox. It also supports voice and gesture controls, can read photos straight from SD cards, lets you control the action from a smartphone, and has a rechargeable battery so you can tote it anywhere you want. Google's G Suite of online tools like Gmail, Google Docs, and Google Drive are designed with collaboration in mind. Yet there's one central point of office collaboration they have yet to touch: the whiteboard. The Google Jamboard is meant to fix this. A 55-inch 4K touchscreen, it links up a companion app running on iOS or Android, letting co-workers see a real-time feed of the board and add their own notes, doodles, and photos. You interact with the board using a passive stylus or your hand, it can change your writing into searchable text and straighten out your shapes and symbols automatically, and everything gets saved up to Google Drive, so Dave from accounting has no excuse when he claims not to remember what you talked about at the last meeting. It's not the first router to offer parental controls, but the Gryphon WiFi Router is one of the first designed with that goal in mind. 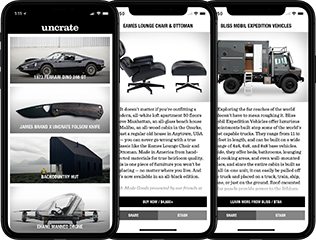 Created by the guys behind the MiFi portable hotspot, it connects to an app that lets you easily set screen time limits, pause access altogether, view browsing history, make a safelist of approved sites, and even approve new requests in real-time. It also has advanced built-in security, with intrusion detection that recognizes attacks and immediately quarantines the target device and also checks for malware. And since none of these features are any good unless you actually want to use them, it has a powerful tri-band setup with beam forming and MU-MIMO technology, mesh networking for easy expansion, and a unique curved design that places the antennas for optimal performance. Marc Newson is known for his curvy, organic, minimal designs. Yet the Jaeger-LeCoultre x Marc Newson Atmos 568 Clock might be his most minimal yet. By encasing the clock's mechanics inside an "extra-clear" glass cabinet, he allows the moving lungs, gears, and most of its other 211 components to shine as never before. And since as little as a single degree move in temperature is enough to power it for two days, there's no need to worry about changing batteries. Hardly anyone carries change anymore, but if you do, you can make it a little more useful with some Hollow Spy Coins. These exact duplicates of real spy coins used by both the CIA and KGB let you covertly carry microSD cards full of important data, or anything else you can think of that will fit inside, all while hitting very close to "real" weight. Available in multiple denominations, including nickels, quarters, half-dollars, pounds, and euros.